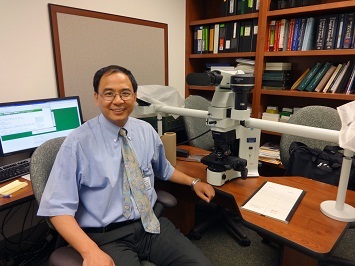 Haodong Xu, MD, PhD is a senior expert in head and neck pathology and cardiothoracic pathology at the UCLA Department of Pathology and Laboratory Medicine. He is an NIH -funded investigator whose research interests include identifying novel biomarkers in lung, head and neck tumors and fibrosing interstitial pneumonia. Dr. Xu's basic research is focused on delineating the regulation mechanisms of voltage-gated cardiac ion channels. Ongoing studies in his lab are focused on defining the functional roles of FoxO1 and Wnt/beta-catinin signaling pathways in the regulation of voltage-gated channels. Dr. Xu received his MD from the Medical College of Soochow University in Soochow, China; completed his residency in Anatomic Pathology at the Washington University School of Medicine, and was a Fellow in Pulmonary and Mediastinal Pathology, Armed Forces Institute of Pathology in Washington, D.C.
Dr. Xu was a member of the reviewer panel for adenocarcinoma classification by the International Association for the Study of Lung Cancer (IASLC). He currently serves on a number of editorial boards, including Human Pathology, Applied Immunohistochemistry and Molecular Morphology, the Journal of Biomedicine and Biotechnology and the World Journal of Gastrointestinal Oncology. Dr. Xu joins us from the University of Rochester Medical Center in New York, where he was Professor and Service Director of Thoracic Pathology in the Department of Path and Lab Medicine, as well as Professor in their Aab Cardiovascular Research Institute, Department of Medicine. 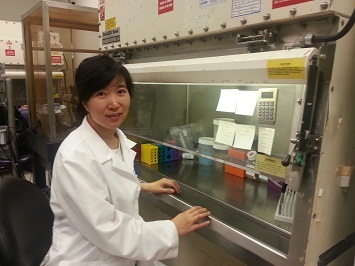 Ning Wang, PhD is a Postdoctoral Fellow in the Department of Pathology and Laboratory Medicine at UCLA. She received her PhD in Pharmacology from Harbin Medical University, China in 2009 and worked as an Associate Professor in the Department of Pharmacology at Harbin Medical University. Her research focuses on the molecular mechanisms underlying cardiac arrhythmias in ischemic heart diseases.